Woven woods and grass cloth shades have a unique look and feel, but are as practical as a cellular blind. 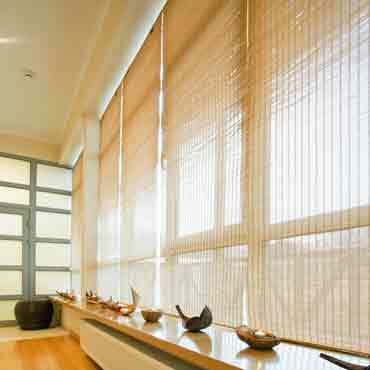 Woven woods and grass cloth shades are woven grass or wood strip mats that can be raised or lowered like a blind. They create privacy while allowing different levels of light and privacy from the outside. Available in several different material textures and colors, Woven Woods and Grass Cloth shades fit virtually every setting, whether elegant or casual.